Django, the Python based equivalent to Ruby's Rails web development framework, is one of the hottest topics in web development today. Lead developer Jacob Kaplan Moss and Django creator Adrian Holovaty show you how they use this framework to create award winning web sites by guiding you through the creation of a web application reminiscent of www.chicagocrime.org. 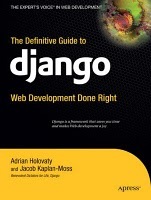 Django: Web Development Done Right is broken into three parts, with the first introducing Django fundamentals such as installation and configuration, and creating the components that together power a Django driven web site. The second part delves into the more sophisticated features of Django, including outputting non HTML content such as RSS feeds and PDFs, caching, and user management. The appendixes serve as a detailed reference to Django's many configuration options and commands. The first half of this book explains in depth how to build web applications using Django including the basics of dynamic web pages, the Django templating system interacting with databases, and web forms. The second half of this book discusses higher-level concepts such as caching, security, and how to deploy Django. The appendixes form a reference for the commands and configurations available in Django. Adrian Holovaty, a web developer/journalist, is one of the creators and core developers of Django. He works at washingtonpost.com, where he builds database web applications and does "journalism as computer programming." Previously, he was lead developer for World Online in Lawrence, Kansas, where Django was created. Jacob Kaplan-Moss is one of the lead developers of Django. At his day job, he's the lead developer for the Lawrence Journal-World, a locally owned newspaper in Lawrence, Kansas, where Django was developed. At the Journal-World, Jacob hacks on a number of sites including lawrence.com, LJWorld.com, and KUsports.com, and he is continually embarrassed by the multitude of media awards those sites win.